While at NoPork Motorsports yesterday for new tires, I spotted this S&S engine-based custom outside the repair garage. It was one of two long stretched-out customs at the shop, both equipped with S&S V-Twins. Both of them are what I think of as “suicide machines”. 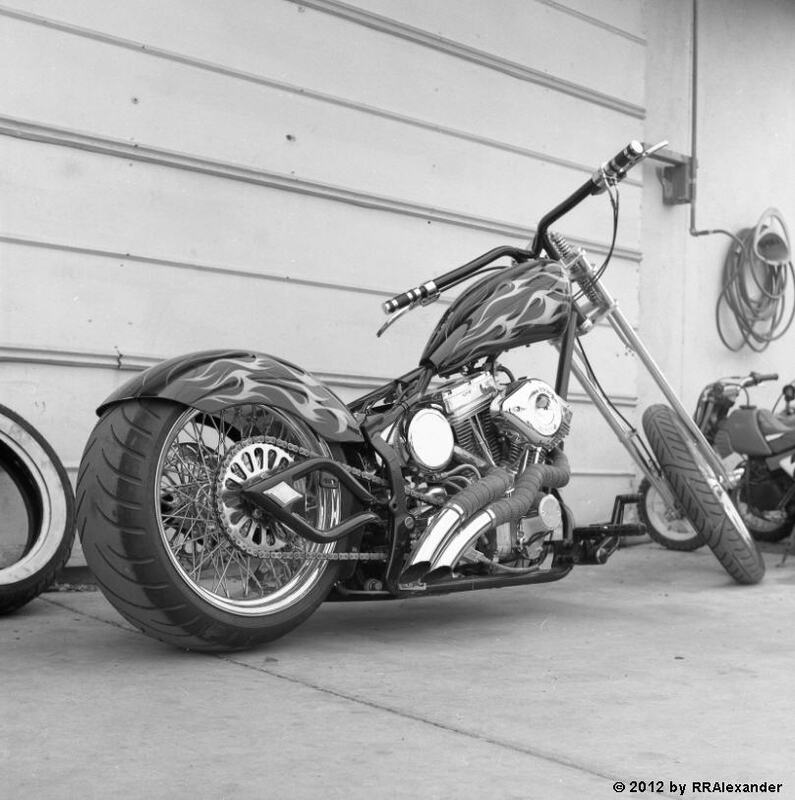 I ran out of 120 film for the Twin Lens Reflex camera when I turned to shoot the second “chopper”. It rates considerably higher on the potential-for-a-quick-death scale, since it had no front brake, just a simple axle. Both bikes look good and might have some utility if their purpose were to ride to the local bar and back. Between the raked out front end which limits the bike’s maneuverability in dangerous situations and the lack of a front brake, I don’t think I’d want to ride that one for more than a few blocks. It would be even more worthless on a long ride because it had a hardtail frame. Hardtail frames are good for detaching internal organs from their proper anchor points in the human body. The bike shown in the photograph is a bit more useful in my estimation. It has a softtail frame, which gives some suspension in the rear, and it would be a lot easier to stop due to a disc brake on the front wheel. But still, both bikes suffer from the lack of maneuverability caused by the long, raked front ends. There is a reason why companies like Harley, Indian, Honda, Triumph, Yamaha, BMW, and Victory don’t offer long raked-out front ends on their motorcycles. That reason is called litigation. Motorcycling is dangerous enough (mostly due to the ignorance and/or stupidity of automobile drivers)* without manufacturers ignoring good, stable design. In the 1970s I hung out with a group of outlaw bikers (I worked with a couple of them) who kept insisting that I should extend the front forks of my stock Harley Superglide, because it would look so much “cooler”. I ignored them because I knew that the factory-designed front end and frame was vastly more maneuverable than their choppers (having rode them for short distances). Deliberately ignoring the fashion of the day saved my life a couple times when I was in situations that I was able to maneuver out of because of my stock bike’s factory design. I wouldn’t have been so “lucky” on a chopper. I was also negatively impressed when I saw long, raked-out front ends flexing wildly over minor bumps in the road surface at freeway speeds. * Keep in mind that passing a driving test only means that one has learned to pass a driving test. It does not mean that one is a good driver.